There's nothing more glorious than a day spent picking wild blueberries in the Chequamegon National Forest. The beauty of the wild on a sunny day, the sound of sandhill cranes flying overhead, and fresh berries warm from the sun. The first time we picked I was surprised to find that when I closed my eyes to turn in for the night thousands of images of blueberries flashed through my mind, one after the other. Blueberry dreams! And as if all that wasn't enough we were able to bring home enough to put a good supply in the freezer. 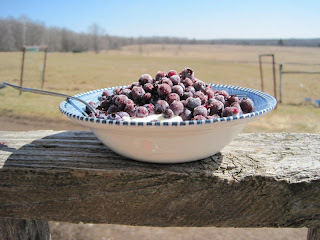 All winter long we've been able to enjoy blueberries in pancakes and desserts and on yogurt with just a little maple syrup and the promise of another gorgeous summer day.